We Travel. We Enjoy Life. We Share Stories. What do pixels and hops have in common? Both are equally important in Avondale, Arizona at 8-Bit Aleworks, a craft beer brewery that geeks will love. Not just craft beer geeks but game geeks as well. Craft beers with game-themed names surrounded by arcade and classic video games. This is what I imagine heaven to look like. It’s like the classic arcade game Tapper came to life… But with better quality beers. And no glasses being dropped. Oh and more happy customers. After reading ‘pixels’, ‘classic games’ and craft beer I knew I had to visit 8-Bit Aleworks. Your first impression is, “this can’t be it, I must have taken a wrong turn”. You’re entering a boring business park, which is empty as all businesses are closed. 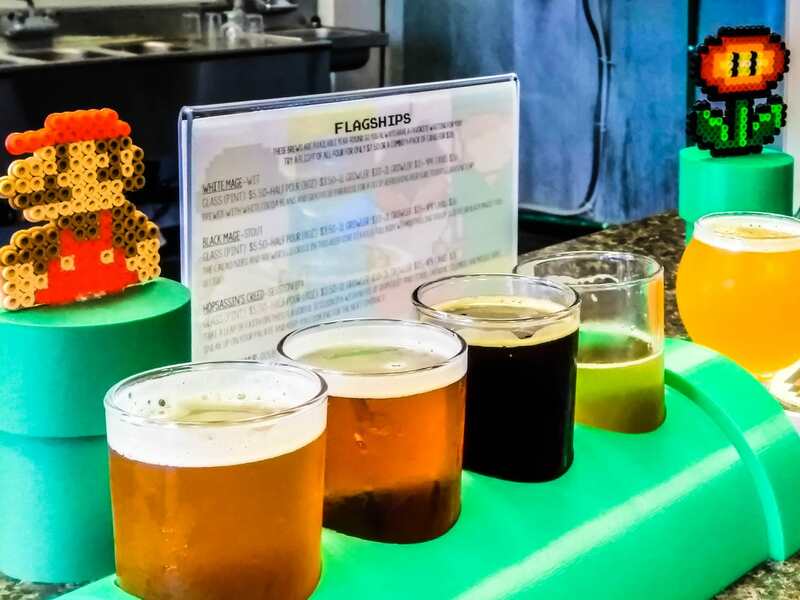 We visited 8-Bit Aleworks on a Sunday. Then you see building F and you realise this is actually the place. As soon as you enter the taproom it feels like you’ve been transformed into another dimension. A classic console and arcade game dimension. You’ll have a hard time deciding to go for the games or the craft beer list first. And the barman can tell you’re a first-timer. It’s that indecisive walk (walking to the left and the right) and the open mouth that gives it away. Best is to sit at the bar and start reading the craft beer menu… And then decide which game you want to play. Want to know how I rated these craft beers from 8-Bit Aleworks? Follow me on Untappd. Tasting some beers or play a game? During the craft beer tasting, I kept looking at that piece of paper on the wall. And talking about it. That piece of paper contained all the info about exciting things to happen. The barrel aged version that will be released soon. And by soon we mean February/March 2019. Guess where I’ll be going in 2019? You guessed it right. I’ll be back. Just being here, tasting the beers and chatting with the local geeks is worth a visit. The game & 8-bit theme can be found everywhere, the décor, the music, and the names of the beers. This is geek heaven. For me, it’s definitely 8.5 out of 10… And the promise that I’ll be back in 2019 to taste the barrel aged versions. No worries, I’ll be there.